It is always said that the foundation to anything has to be strong for long term benefits. The same holds true for our kids too when we are nurturing them in their growing years. As a mum, I understand that strong immunity system is very important for my child as that will help her build the strength to fight against diseases in the growing years. To build a strong immunity system, the body needs to identify the correct nutrients that suit the body system and have a regular intake of those nutrients in various forms of food. As mothers, we want our child to be the best - one that is well behaved and disciplined, and in the process of that we often try to tell them "no" for certain things. What we don't realize is that children are really impressionable and they adopt behaviours by observing and imitating the people they are close to and interact with in the house, play area or school. Also, when you are constantly telling your child “no”, the child is scared to ask you even for new things, because they assume that you could get angry and they will get scolded for it. As parents we need to be careful when we try to instruct them or educate them about the things they need to learn about. It is important to be a #YesMom because that will make them feel comfortable enough to share their thoughts, their feelings and their problems, as well as be experimental. I have noticed the changes myself when I took up the #YesChallenge. Earlier when I would restrict Aryaa from doing something like sucking her fingers and then she would stop doing it, I would think that this had a lasting effect. But later I would get complaints from school that she was doing it there and then realised that she was still sucking her fingers in my absence. 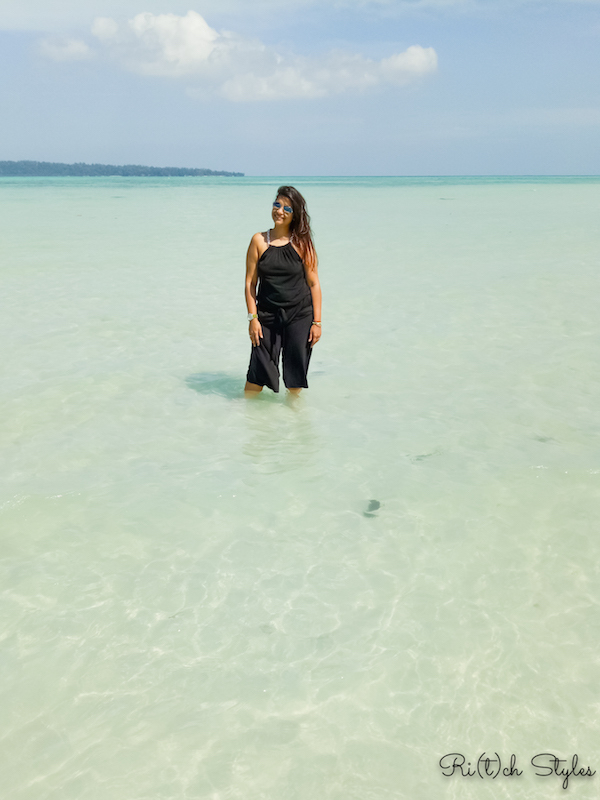 Also she had picked up the habit of saying no to everyone in school who would ask her to do something, especially her teachers and also to me at times at home. That is when I decided that this has to change and gradually have been practicing being a #YesMom, and I see now that if she understands the logic behind the instruction, it is much more effective. I talk to her, let her do things herself at times to realize that she is wrong, and also sometimes let her do things that while I felt she is too young for, she manages quite well and they make her immensely happy. With food that has become a practice for me too. I don't force her to drink milk at fixed times or eat vegetables she doesn't like, but substitute with food items that would give her similar nutrition or things she wants to have and enjoys. 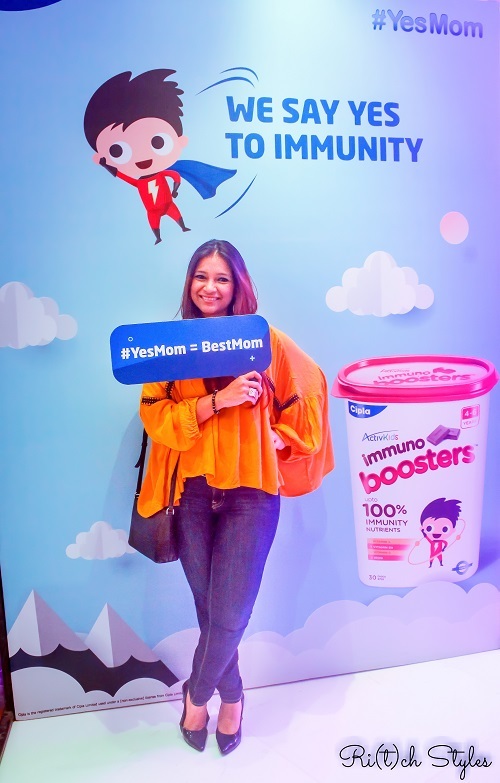 To help us to become Yes Moms for our children, Cipla, a leading pharmaceutical company in India, has come up with ActivKids Immuno Boosters. 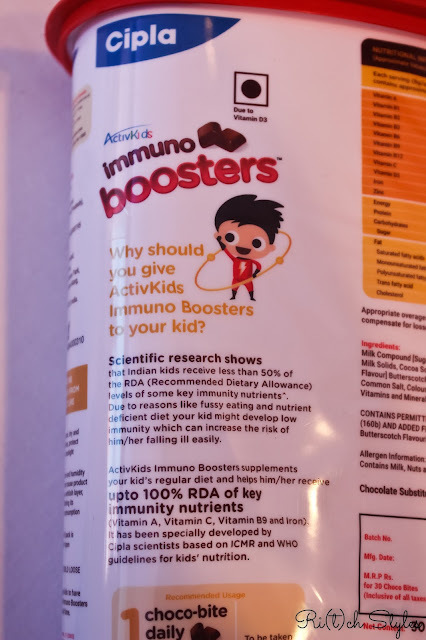 This is an immunity supplement for children formulated in a unique choco-bite format that we can give to our children to balance the immunity nutrients in their body. Now you must be wondering that if it is chocolate, then eventually it might lead to other problems like cavities and excess sugar in our child's body. But moms you don't need to worry about that, the choco-bites come with low sugar levels that make sure that there is no risk of a dental cavity, and doesn't contain artificial colours or preservatives that can harm the child's system. It is also gluten free and has 100% Recommended Dietary Allowance of the key nutrients required to boost the immunity of our child. ActivKids Immuno Boosters also helps as a supplement if the child doesn't end up eating a proper diet due to various reasons. At the launch event of the Cipla ActivKids Immuno Boosters, Nutritionist, Dr Niti Desai, Paediatrician, Dr Deepa Bhandarkar, Psychologist, Dr Sapna Zarwal along with Mandira Bedi gave us some great insights on how to train our child to be healthy and how we as parents can make communication with our children easier. Parents are responsible to a great level when it comes to forming food habits of their child, however you should not force the child to eat or drink something if the child doesn't like it or enjoy eating it. Respect the taste buds of the child and make the food table a happy place for them instead of a war zone. There are a zillion variety in foods that will help them balance their protein, calcium and iron requirements of the body. There will come a point when the kid is fussy about eating something, but we as parents need to be smart enough to convince our child and allow them to choose as to what they would enjoy eating the best. Mandira Bedi was accompanied by her son Vir and together they launched the Cipla ActivKids Immuno Boosters. As a mom, I recommend that all parents should allow their child to formulate their own food habits. When someone forces us to eat something we don't like, we also react and don't eat it, right? Then why should we force our child to eat something that they don't enjoy eating. 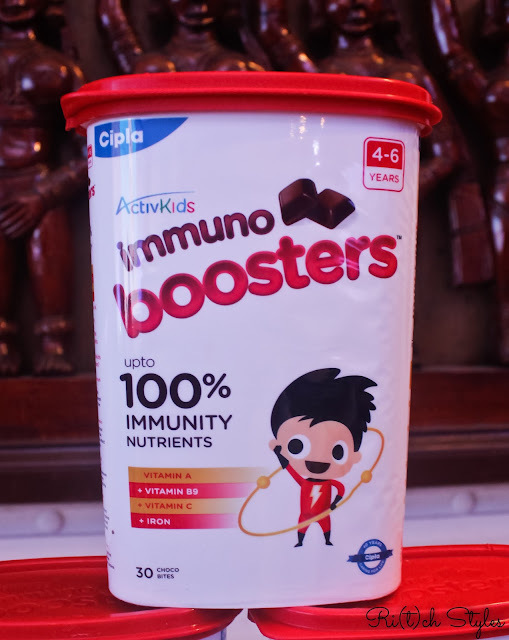 ActivKids Immuno Boosters by Cipla is going to help us achieve that without any worries! I look forward to introducing it to Aryaa and I would strongly recommend the product to you too. So, say Yes to your child, say Yes to Immunity with ActivKids Immuno Boosters. YesMom is a great initiative. Lovely post. Yes mom is a lovely, positive by Cipla. I liked the concept of the immuno booster. Must try for my kids. Fantastic post. And indeed a great initiative. My daughter is too young or I would have definitely tried this with her. Great post. The product sounds awesome. I just got my pack! Love the idea of #YesMom. Did your daughter like it?